Upon getting accepted to my PhD program in English a few years ago, I mentioned to a senior scholar at another university that I was interested in studying queer Canadian literature. He laughed and said, “But that’s a niche of a niche,” quickly condemning my proposed research to the intersection of minor and obscure. While nearly half a century had passed since Northrop Frye asked “Where is here?” in his “Conclusion to The Literary History of Canada,” and about a decade after Peter Dickinson had replied with his Here is Queer, I still needed to defend—to one skeptical scholar of British modernism, anyway—the merits of studying LGBTQ writing in Canada. Perhaps the study of Canadian literature, and its many so-called “niche” interventions, will always have to give an account of itself. 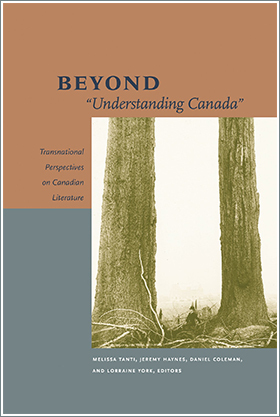 If the accounts offered in the recent volume Beyond “Understanding Canada”: Transnational Perspectives on Canadian Literature are any indication, such measures may be very productive. There is much accounting in this book, in the strictly financial sense. The collection, and the 2013 McMaster University Understanding Canada Conference where these essays were first delivered, was developed in response to the Conservative federal government’s shuttering, in 2012, of the program of the same name that had funded the foreign study of Canada, under one guise or another, for more than forty years. As the editors Melissa Tanti, Jeremy Haynes, Daniel Coleman, and Lorraine York observe in their introduction, the Understanding Canada annual program budget of $5 million was a relatively small investment considering the amount and quality of scholarship (such as the essays in this volume), as well as the good foreign PR, Canada received in return (xii). In her essay, Smaro Kamboureli points out that by 2012, the Understanding Canada program had returned $70 million to Canada’s economy (15). Yet, while Kamboureli notes the effects of the government cuts on the infrastructure of an international Canadian Studies, she also cautions against focusing exclusively on the bottom line and rather calls upon critics to question the very foundations the Understanding Canada program was meant to bolster: Why do we need the study of a national literature when the concept of “nation” has been so “radically questioned and reconfigured” (17)? Kamboureli views the program’s defunding as a potential “turning point” (20) in Canadian literary studies that can take us “beyond” Canada proper as the limited terrain of inquiry, and toward a whole range of critical intersections—neither minor nor obscure—that offer new ways of making CanLit count.